JOHANNESBURG – There’s not much of a surprise here. 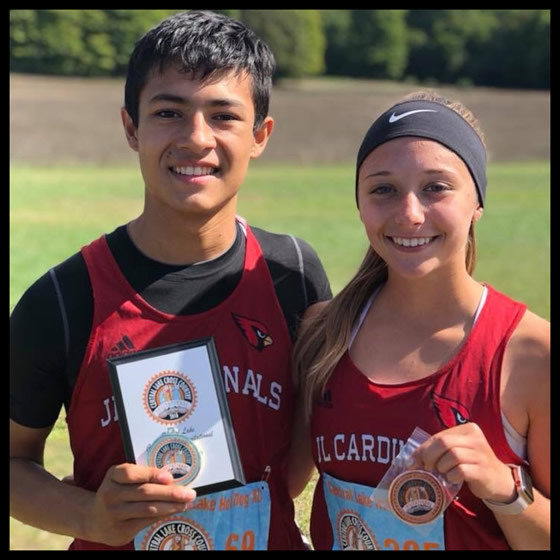 Two of the most consistent finishers in Otsego County have been Johannesburg-Lewiston sophomore Carlos Gascho and Gaylord sophomore Cambrie Smith, who are the Herald Times’ Male and Female Cross-Country Runners of the Year, respectively. A stingy calf injury wasn’t Gascho’s only challenge this fall. Aside from the handful of races with Harbor Springs’ Jeremy Kloss, Gascho didn’t have anyone at races to push him to run his hardest. His biggest rival last year, St. Mary’s Brendan Delaney, graduated in the spring as did Fairview’s Tyler Ross, who battled Gascho at the 2017 regional. So it’s amazing to think about how far Gascho’s come since freshman year. Gascho was both the individual Ski Valley (17:06) and Division 4 regional (16:46) champion – to go with a handful of other individual wins at other races. 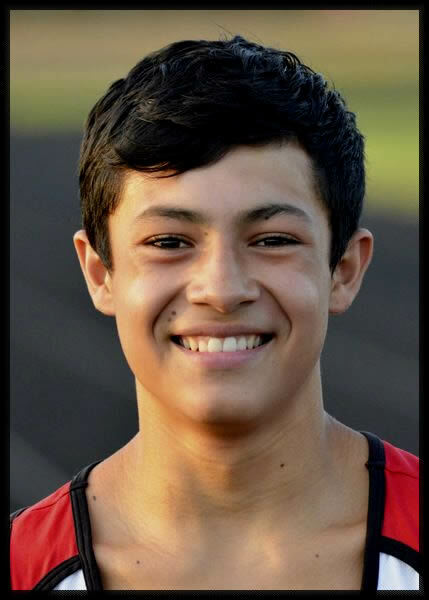 On top of that, he took eighth individually during the D4 state final, setting J-L’s record in the 5 kilometers at 16:33 and becoming an all-stater. Gascho said this season tested him mentally. The Herald Times' All-Area Cross-Country Team is here! Selected are the area's top runners, regardless of Class or Division. Prepared by sports editor Brandon Folsom. Where some runners saw a challenge, Carlos Gascho saw an opportunity. Retched course conditions during the Division 4 cross-country state championship Saturday created chaos. Gascho did his best to maneuver the Michigan International Speedway course in Brooklyn. The Johannesburg-Lewiston sophomore placed eighth individually. He crossed the finish line in 16:33, breaking his own school record by seven seconds. It was the second time he broke the record this fall. He finished as an all-stater. "The course was really soggy and wasn't firm," Gascho said. "It was sloppy all over the place, from the middle of the race until the end. So to get through the whole length of the course, it was just all heart for me. "There were kids giving up left and right. Me and the kids on my team, we did what we do best – just get through the race as best as we can." 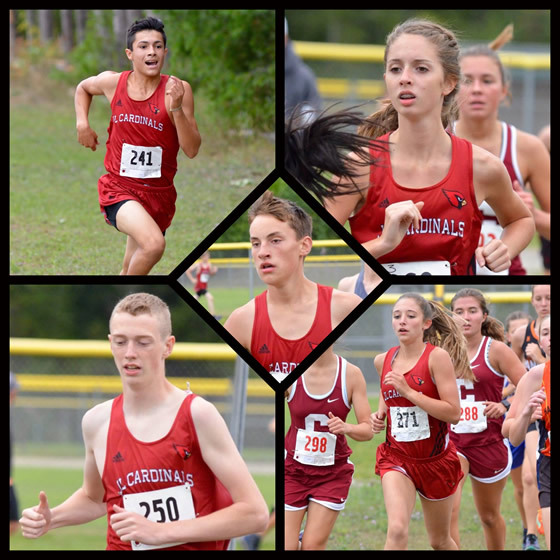 Both the Cardinals' boys and girls placed 26th as a team. It was the first time in program history both teams qualified for the state championship together. Jack Perry (18:50) and Gavin Weaver (19:55) each placed in the top 150. Gage Boughner (20:29) and Spencer Townsend (20:49) also placed. Toby Hall (20:57) and Elijah Fisher (22:11) ran as reserves. The girls race saw Sydney Townsend (21:41) and Kennedy Johnson (22:19) each put in top-75 efforts. Jersey Layman (24:19) placed in the top 150, while Lydia Hummel (25:00) and Claire Mullins (25:32) also competed. Kamryn Kennedy (31:21) and Elizabeth Eaton (31:30) ran as reserves. "It was cool having both teams down there," J-L coach Craig DeHoog said. "It was like a sense of accomplishment for the program. It shows we're growing the program and the kids are working hard. This will help strengthen our program because the middle school kids see what the high school kids are doing, and it makes them work just as hard. "Hopefully, making it to the state finals remains a trend. I know it won't happen every year for both teams, but that's what our goal will be." What challenged Gascho the most, he said, was getting a proper start. A left hamstring injury has hampered him all season. "I wanted to start out fast and get ahead of the slower runners," Gascho said. "I didn't want to get left behind by the top pack, so the start was challenging, taking the first few steps and pushing out hard. It was especially hard with kids slipping and falling everywhere." Gascho was projected to finish in the top 15, according to athletic.net's entry list. He wasn't surprised by placing eighth. "I was chasing kids, one kid after another," he added. "I knew those kids were going to push me, so it felt good. It got me going hard." DeHoog, too, wasn't shocked by Gascho's effort. "He's really determined," the fourth-year coach said. "It's his competitive nature. When he's in a race situation, he's locked in. Some races, he likes to say he's in a groove. Some races he's been really locked in. "Today was another one of those days, and he was super competitive. When he wants something, he goes after it pretty hard." The Cardinals graduate just two seniors from their starting lineup in Layman and Eaton. OTSEGO COUNTY — Otsego County is sending 17 cross-country runners to the state championship Saturday, Nov. 3, at Michigan International Speedway in Brooklyn. That includes both the boys and girls teams from Johannesburg-Lewiston, which will have 14 line up in the starting box for the Division 4 state final. Someone to keep an eye on is Carlos Gascho, the two-time Ski Valley individual champion who won last week’s regional title as well. The sophomore hasn’t finished worse than second place at any meet he’s been able to finish. But that’s the key here. Can he finish? A calf injury has bothered Gascho all season long. Two weeks ago, during the Northern Michigan Championships, it flared up so badly he couldn’t even complete the race. The injury bothered him some more during the D4 regional, but he toughed it out to ensure his second-straight trip to MIS. As it stands today, he is the 14th-fastest boy in his division thanks to the 16:40 he ran earlier this season in Central Lake. While he ran only five seconds slower last week, he still has some time to shave. If the race goes his way, he could push himself into the top 10 and finish as an all-stater. “I just want to place top 10 again,” he said last week. “That’s the big goal, but my main objective is to place top five. Gascho will be joined by an impressive set of teammates. Gavin Weaver has been a consistent runner for J-L the past three years, but his running buddy, Jack Perry, is having a break out year. Since the middle of last season, he has shaved over a minute off his time and is now running steadily below the 19-minute mark. Freshman Toby Hall has been a pleasant surprise as the team’s No. 4 runner, one coach Craig DeHoog loves to talk about, while Spencer Townsend has become another constant for the Cardinals at the bottom of the lineup. J-L will also have Gage Boughner and Elijah Fisher as reserves at the state final, both of whom are capable of breaking 20 minutes. In the girls race, it’ll be interesting to see how Sydney Townsend continues her progression. The sophomore split time with the equestrian team throughout the season, which hampered her ability to get faster. Since the equestrian season has wrapped up, Townsend has gotten better each race, including finishing as the D4 regional runner-up a week ago. Her 20:37 there was not only a personal best but it ensured she’d enter the state championship as the 51st-fastest girl in her division. “I think it’s made a big difference,” said Townsend on focusing on only running now. “My body is feeling great. I haven’t had any soreness, and my lungs have been feeling good. Maybe the standout runner of the season has been Kennedy Johnson, who has trimmed 90 seconds off her time in the last month alone. The freshman finished the regional in 22:00, which was 2:33 faster than her first true 5K. Freshman Lydia Hummel has been a consistent runner for the Cardinals, while senior Jersey Layman has been a welcome addition as a first-year runner. Claire Mullins, Elizabeth Eaton and Kamryn Kennedy have also helped the Cardinals this fall. 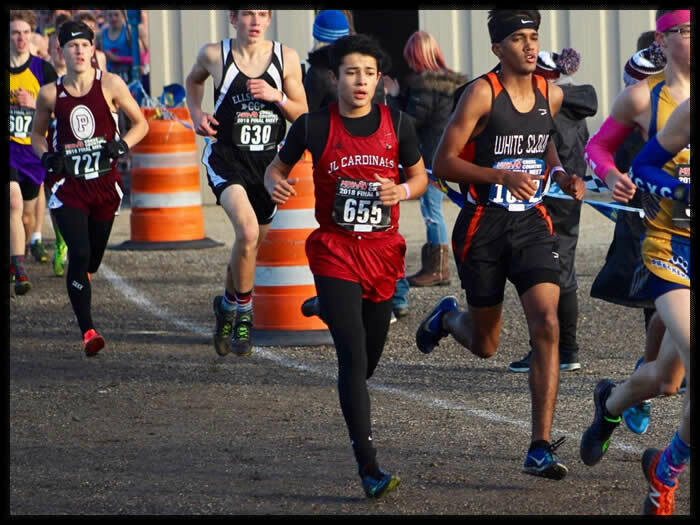 GAYLORD – Carlos Gascho was nervous, and even scared, to run in the Division 4 cross-country regional Saturday morning. The Johannesburg-Lewiston sophomore injured his left calf during last week's Northern Michigan Championships, which is held on the same exact course (Michaywé Pines Golf Course) as the regional. So he didn't want to injure himself some more while attempting to qualify for the state championship slated for Saturday, Nov. 3, at Michigan International Speedway in Brooklyn. Gascho wound up running a conservative race, but he finished in 16:45, which was good enough to become the individual regional champion. "I was really nervous," he admitted. "I didn't want it to happen again. My goal was to place in the top 15 today and make it to states again. "But winning it was a much bigger score for me." Last week, Gascho left the starting box too quickly, exerting too much force during his first two steps. "I felt it shoot right up. It just hurt," he recalled. "So today I was really worried that it was going to happen again." By the 800-meter mark, Gascho had cramped up. He messaged his calf and then jumped back into the race. But, once again, he took off too fast. "I passed a big group of kids, and it cramped up again," he said. "It was really hard for me to walk off the course without being able to finish. "Mentally, I'm always scared. I try to tell my self to calm down. It's only one race. It's OK. Just go home, rest up and prepare for next week." And that's what Gascho did. Although he was cautious at Saturday's regional, he was motivated to not only finish the race but try his best to win the whole thing. His goal was to finish in the 16:30s – and he was really hoping to break the 16:20s – but he wound up burning too much energy during the opening mile. He didn't have much left for the final 800 meters, he said. Crossing the finish line in first place, though, was still a huge achievement. "Today was a huge confidence booster," said Gascho, who also was the individual Ski Valley champion earlier this month. "I kept my composure and didn't freak out or take it easy. I still pushed myself to get out there and put in a top run." Gascho said he'll "baby" his calf while he prepares for the state final. He said he has a lot more to prove at the state's biggest meet. "Next week, I just want to place top 10 again," he said. "That's the big goal, but my main objective is to place top five. But we have new runners dropping into our division, so it'll make it a little more scarier, a little more competitive." Gascho's always proved he's a great competitor while running scared. So that might play into his favor in Brooklyn. • Gascho won't be competing alone at the state final. The Cardinals placed third as a team – behind only East Jordan and Ellsworth – to earn an automatic berth into the state championship. Helping in that effort were Gavin Weaver (18:47), Jack Perry (18:50), Toby Hall (19:43) and Spencer Townsend (19:55). Running as reserves were Gage Boughner (20:00) and Elijah Fisher (20:04). Other SVC teams placing at the regional included Inland Lakes in fifth, Onaway in eighth and Central Lake in ninth. • Being a five-sport athlete like Sydney Townsend comes at a premium, and sometimes certain sports have to take a back seat. That was true for the sophomore this fall. While she continued to have success on the equestrian team, it continued to pull her away from the cross-country program. Well, equestrian finally wrapped up three weeks ago. So Townsend had almost an entire month to dedicate to preparing for the regional race. And what a difference that made. Townsend crossed the finish line in 20:37 to become the D4 runner-up. Only Rogers City's Morgan Baller (20:26) was faster than her. "I think it's made a big difference," said Townsend on focusing on only running now. "My body is feeling great. I haven't had any soreness, and my lungs have been feeling good. "At the beginning of the season, I definitely struggled to keep up. After (equestrian ended), I just started working hard in practice." Townsend said she felt a jolt of energy during the second loop around the 5-kilometer course. That allowed her to spot opposing runners and begin picking them off one by one. "I don't even really know where it came from," she said. "Before the race, I knew I really wanted to get top five. Then I just tried to keep up with East Jordan the whole time. My body felt great. I didn't feel any pain or anything. "In my mind, I just kept saying, 'I want it. I want it.' I just kept pushing myself throughout and just kept looking for girls." One of those girls was St. Mary eighth-grader Alivia Zaremba, who edged Townsend for the SVC individual title earlier this month, which was a big deal because Townsend entered the SVC race as the defending champion. "St. Mary is our rival, and I really wanted to get her," Townsend said. "It wasn't really my goal (before the race), but I really wanted to do it. It really just pushed me as soon as I saw her in front of me. "We kind of raced each other for a little bit, and then I just felt a kick and just let it go." Apparently, horses aren't the only ones with dangerous kicks. Townsend will look to use hers during the state final at MIS. 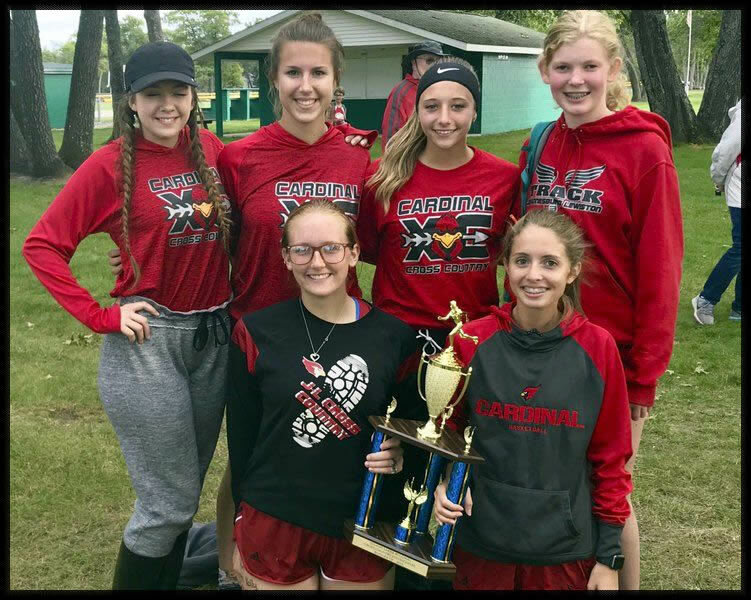 • Just like the boys, the Cardinals' girls team finished third overall to punch their ticket for the state championship. Another breakout performance from Kennedy Johnson, who finished in 22:00 and took 13th individually, pushed J-L to its finish. Also scoring were Lydia Hummel (22:42), Jersey Layman (23:53) and Claire Mullins (25:54). Elizabeth Eaton (29:03) and Kamryn Kennedy (29:06) raced as well. East Jordan won the meet, followed by Ellsworth in second place. Inland Lakes was fourth, St. Mary placed fifth, Central Lake took eighth and Pellston rounded out the other SVC teams present with a ninth-place effort. GAYLORD – Saturday's dress rehearsal didn't go as planned for the Johannesburg-Lewiston boys cross-country team. But the Cardinals' effort during the Northern Michigan Championships at Michaywé Pines proved to be a boon anyway. Two-time Ski Valley individual champion Carlos Gascho suffered a calf injury before the midpoint of the race. He couldn't finish and his availability going forward is unknown. J-L finished 25th out of 27 teams there. So Nos. 2 and 3 runners Jack Perry (18:43) and Gavin Weaver (19:25) stepped up and seized the opportunity at hand. Michaywé Pines hosts the upcoming Division 4 regional and the same course layout is expected. The junior duo got a chance to learn the lay of the land and find spots on the course where they can make up time. They also got to compete against bigger Division 1 and 2 teams and try their best at keeping up with other competitive runners. The course is much different than the hilly courses the Cardinals compete at during the conference season. "It gives you a perspective of where you need to push yourself," said Weaver of the mostly flat and grassy course. "When you run hills like we normally do, it's hard to tell where you need to push yourself. "This helps you get a perspective of where you are against the other schools in our division. Now we know where we need to improve and how we need to push each other to get faster." 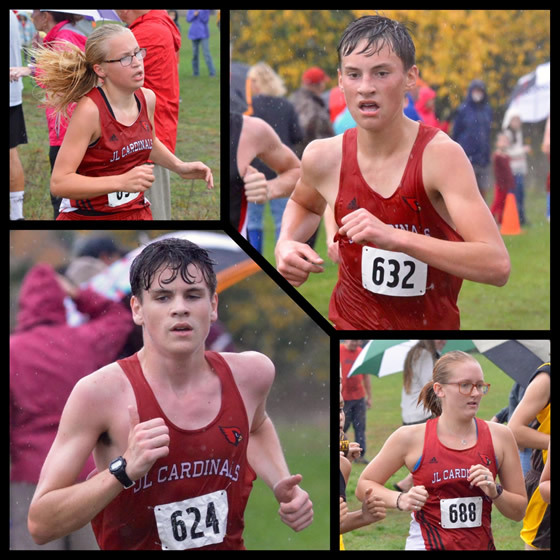 Gage Boughner (19:50), Spencer Townsend (19:51), Elijah Fisher (20:14) and Toby Hall (20:25) also ran for the Cardinals. Each ran personal bests. "We learned what we can improve on in this race, and it's definitely going to improve us for regionals," said Perry, who beat his personal best by about 40 seconds. "It's about learning to adapt from the races before – they were mostly hilly. From a race that was mainly hills to a race that is mainly a flat course, you definitely can have much room to improve. "Running today definitely helps us. Running and training on hills pushes your stamina and makes these kinds of courses much easier." Five of J-L's seven girls finished with personal bests, with Sydney Townsend (21:28) leading the way in 69th place. Kennedy Johnson (22:06) had a breakout performance, while Lydia Hummel (23:00), Jersey Layman (24:02) and Claire Mullins (26:21) also ran for the 20th-place Cardinals. Elizabeth Eaton (28:56) and Kamryn Kennedy (30:22) competed as J-L's reserve runners. 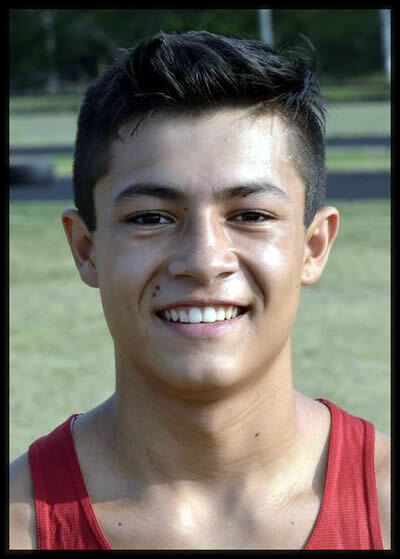 FAIRVIEW — After winning the individual Ski Valley championship Wednesday, Johannesburg-Lewiston sophomore Carlos Gascho followed it up by winning the annual LeRoy Maxie cross-country invitational Saturday at Fairview. Gascho, who transferred from Fairview to J-L before his freshman year, helped the Cardinals place second as a team. Mancelona won the meet, while Whittemore Prescott took third. Also competing for the Cardinals were Gavin Weaver in seventh, Jack Perry in eighth, Gage Boughner in 16th and Spencer Townsend in 20th. Elijah Fisher (24th), Toby Hall (25th) and Evan Idalski (40th) also raced. In the girls meet, Sydney Townsend took first place to push J-L to a second-place finish. Mancelona won the meet, and Central Lake placed third. Kennedy Johnson placed fourth, followed by Jersey Layman in 12th, Claire Mullins in 15th, Kamryn Kennedy in 22nd, Elizabeth Eaton in 24th and Holly Kussrow in 26th. In middle school action, Ki Gascho and Jacob Wartenberg took first and second, respectively, on the boys side. Blake Fox placed sixth, and Ronin Vaden was 10th. The girls race saw Layla Gascho place third, Lizzie Halbert take sixth, Eliza Idalski finish seventh and Rosie Gascho end up eighth. Girls: Sydney Townsend 1st, Kennedy Johnson 4, Jersey layman 12, Claire Mullins 15, Kamryn Kennedy 22, Elizabeth Eaton 24, holly Kussrow 26. The Cardinals run next during the Northern Michigan Championships on Saturday, Oct. 20, at Michaywe Pines Golf Course. MANCELONA – Carlos Gascho used a permanent marker to write “BNF” on his left arm before Wednesday’s Ski Valley Championships. 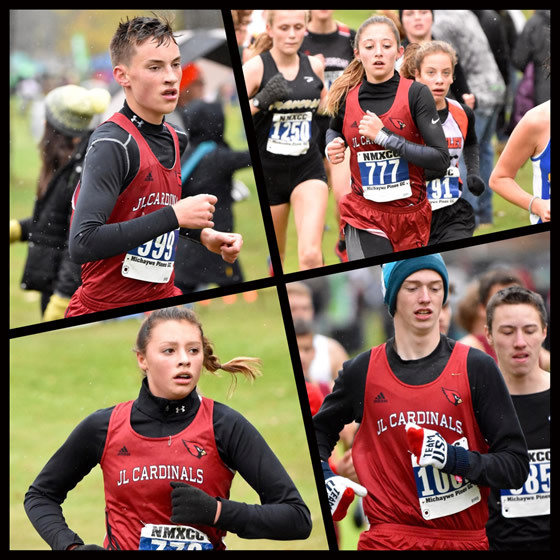 Going into the season, the Johannesburg-Lewiston sophomore thought his team didn’t exude too much confidence because of how many seniors it graduated from its conference championship-winning cross-country team in 2017. Some of them feared they wouldn’t be able to repeat. So he came up with the saying “believe no fear,” and the Cardinals have used it as their mantra all season long. 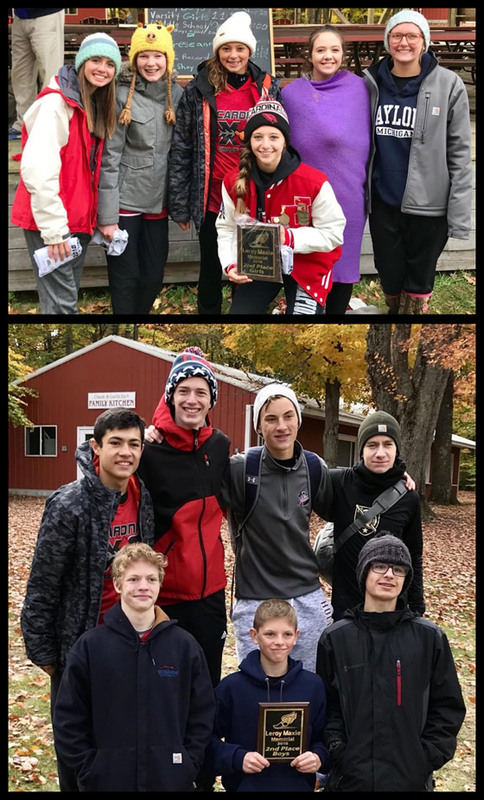 While they didn’t repeat as Ski Valley champions at Mancelona, they did finish as the runner-ups behind the Ironmen, beating Inland Lakes, Onaway and Bellaire. What’s more, Gascho crossed the finish line in 17:06 – over a minute faster than Mancelona’s Tyler McClure, the second-place finisher – to repeat as the individual boys Ski Valley champion. Gascho was fearless as he tackled the retooled course at Mancelona High School. His goal was to finish each mile around 5:30 so he could break 17 minutes and post a strong score as he readies himself for the Division 4 regional in two weeks. He hit his first mile at 5:10 and then he clocked in his second mile at 10:40. He was well on his way to reaching his goal, even waving his arms up and down to control the lactic acid in his body and find a proper running rhythm. But then he started struggling down the stretch. “I felt really good, and I felt strong until that last mile,” he said. “During that last mile, really I just died. But it looks like everyone just ran slow times today. I was really hoping it would have been a good time today because of this weather — I love running in (rainy) weather. It is what it is. Jack Perry (18:55) and Gavin Weaver (19:03) took seventh and ninth, respectively, to help the Cardinals. Also scoring were Spencer Townsend (20:38) and Gage Boughner (20:48) who took 17th and 18th. Toby Hall (21:36), Elijah Fisher (21:42), Aaron Latusek (21:47), Vince Hummel (22:04), Cody Layman (22:15), Ethan Voss (22:23), Evan Idalski (23:56) and William Carey (24:37) also competed. St. Mary didn’t have enough runners to score as a team, however, Aidan Yaske (24:05), Ian Oliver (24:08), Nic Switalski (24:51) and Kyle Brown (26:36) each raced for the Snowbirds. Up next for the Cardinals is a meet Saturday, Oct. 13, in Fairview. Then it’s the Northern Michigan Championships on Saturday, Oct. 20, at Michaywé Pines Golf Course, the same course the regional meet will be held at. Gascho knows it’ll be important to ride Wednesday’s success into those two meets. “I feel really good about regionals,” he said. “Today was something where the last mile just happened. Hopefully, I can clean that up and really accelerate during my next performance." At the start of the season, it looked as if Inland Lakes and Mancelona were going to push the Johannesburg-Lewiston cross-country team, the defending Ski Valley champions. While that still might be true, the Cardinals proved Tuesday that they're still a contender to win it all again this year. Both J-L's boys and girls teams were runner-ups at an invitational at Inland Lakes, beating the host Bulldogs, St. Mary and Pellston. Only Boyne City, a Class B school, finished better than the Cardinals. Carlos Gascho (17:22) and Jack Perry (18:46) placed first and third, respectively, to pace the boys team. Spencer Townsend (20:45) and Toby Hall (20:49), a freshman who has ascended the Cardinals' lineup since Day 1, took 13th and 14th, while Elijah Fisher (21:05) was 16th. Also running were Aaron Latusek (21:06), Cody Layman (21:39), Vince Hummel (22:38) and Evan Idalski (25:30). "The team's top 1-2 punch of Carlos Gascho and Jack Perry lead once again," coach Craig DeHoog "But without top-five runners Gavin Weaver and Gage Boughner today, the other runners stepped up. Spencer Townsend and Toby Hall cracked the team's top five once again as well as Elijah Fisher for the first time this season. "The depth of the boys team is really showing." The girls team finished with three top-10 runners, including Sydney Townsend (22:44) in fourth, Jersey Layman (23:47) in ninth and Lydia Hummell (23:51) in fourth. Kennedy Johnson (23:55) and Claire Mullins (26:49) also scored. Kamryn Kennedy (30:42), Elizabeth Eaton (31:38) and Holly Kussrow (32:28) competed as well. "The girls edged out Ski Valley Conference foe Indian River by two points for a second-place trophy," DeHoog said. "Returning to action (after missing the last two meets), Sydney Townsend was the team's top runner. Jersey Layman was second, and the dynamic freshmen trio of Lydia Hummel, Kennedy Johnson and Claire Mullins continue to shine and have an instant impact." Also competing during the meet was St. Mary, whose girls team took fourth place but boys didn't have enough runners to score as a team. Alivia Zaremba (20:51) is doing her best to fill in the shoes of recent graduate Averi Bebble, as the eighth-grader was the individual champion of the girls race, even beating out Townsend, who won the SVC title last season. 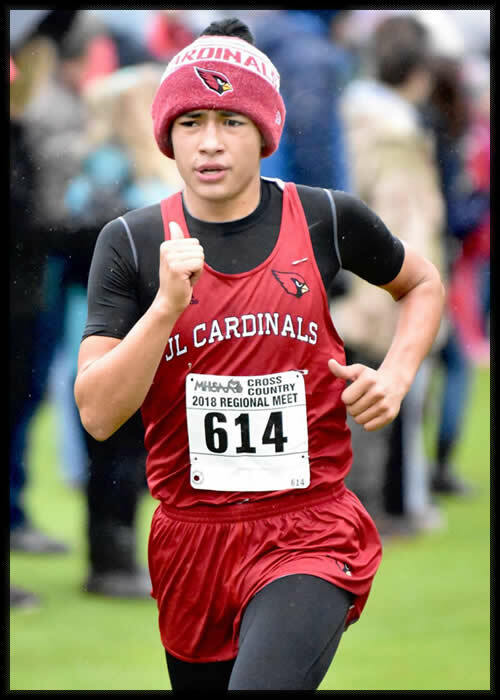 Despite being thrown in the big-school division, Johannesburg-Lewiston cross-country runner Carlos Gascho fit right in. Once again, Harbor Spring senior Jeremy Kloss (16:03) placed first, but Gascho (17:13) finished behind him in second during the House on the Hill meet Saturday in Ellsworth. 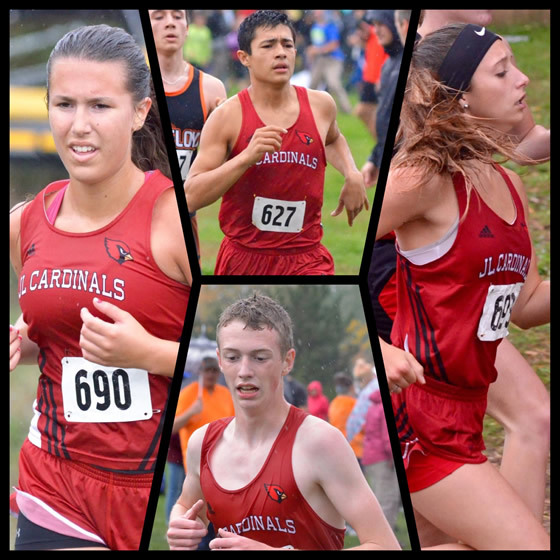 Both the boys and girls Cardinals' teams placed seventh out of 10 teams, battling both Division 2 and 3 teams as well as the heat. "(It was) very hot conditions, overall, so (it was) great to see runners step up and help out the team," J-L coach Craig DeHoog said. 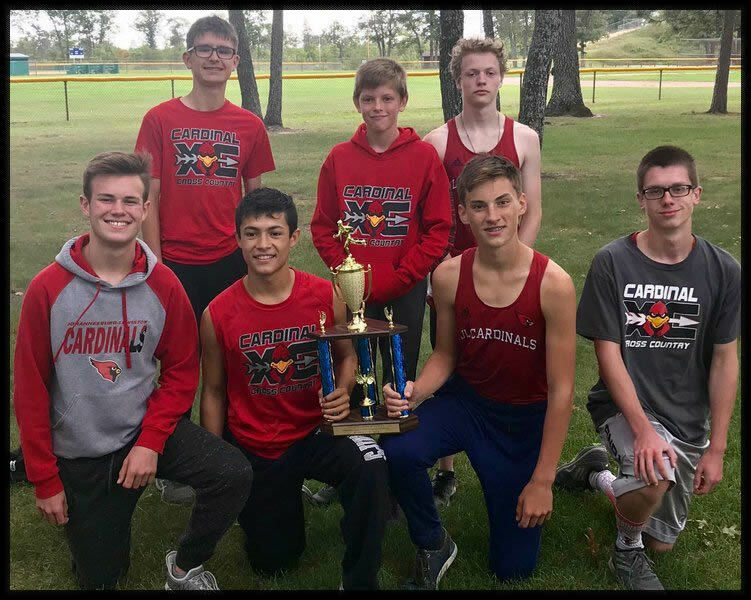 Jack Perry (20:11), Gage Boughner (20:52), Cody Layman (21:34) and Aaron Latusek (21:49) each scored for the Cardinals, while Gavin Weaver (22:07) and Toby Hall (22:08) also competed. The girls were without top-runner Sydney Townsend, but Lydia Hummel (24:27), Jersey Layman (24:28) and Kennedy Johnson (24:42) each placed in the top 50. Claire Mullins (29:11) and Elizabeth Eaton (32:05) also scored. Kamryn Kennedy (32:14) and Holly Kussrow (34:28) raced as well. EAST JORDAN – The scary part is Carlos Gascho isn't 100 percent healthy yet. The Johannesburg-Lewiston sophomore placed second individually in a Division 3 and 4 cross-country meet Wednesday at Rotary Park. He crossed the finish line in 17:05, four seconds faster than third-place finisher Benjamin Lentz of Charlevoix. Gascho suffered a calf injury before the season started. 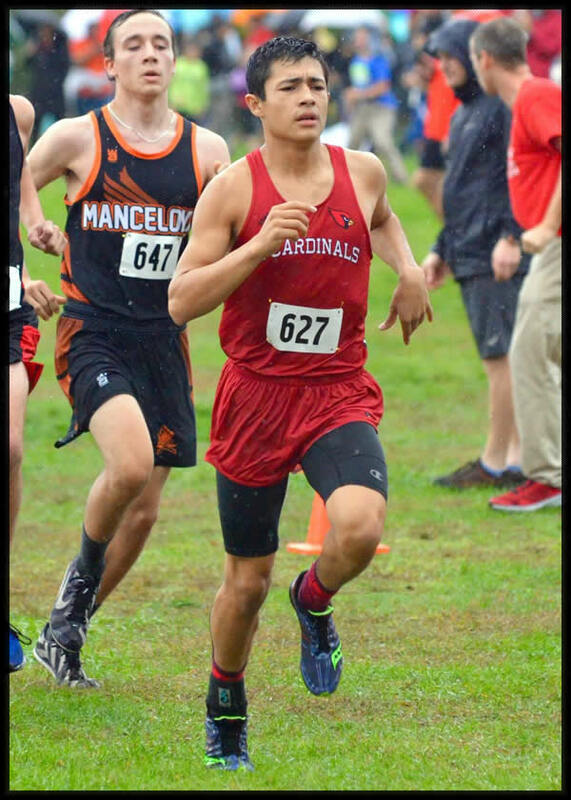 He missed the opener at Central Lake but returned for J-L's second meet at Mancelona, ultimately winning the race despite still feeling the ill effects of his injury. "Running on hard surfaces is what hurt it," Gascho said. "At Central Lake, when I was running, I was running in the sand the whole time because it felt better on my calf. Running in the sand really helped. "Today there wasn't much sand at all, so today I wanted to get into a good rhythm and see how good I'd do from there." Although he was injured, Gascho's goal was to keep up with Harbor Springs senior Jeremy Kloss, who will likely compete for or win an individual state title in November. Kloss quickly separated from the pack and won the race 66 seconds faster than anyone else. He finished in 15:59. "I was going to try to stick with Kloss today," Gascho said. "Today my calf didn't feel right, so I got a nice, easy pace and rhythm. It feels good to get in a rhythm. It doesn't hurt once I get into a rhythm, and it feels pretty good from there. "It's (the calf injury) getting a little better. It's getting a little stronger. Today was another day to get my feet wet." Gascho has been taking magnesium to help his calf heal. Cramps have bothered him, though. He expects he'll need another week to continue recovering. For now, he's just thankful he had Lentz to run alongside and compete with today. Last year, Gascho battled St. Mary's Brendan Delaney for Ski Valley supremacy all season long. Gascho later edged Delaney for the conference title. Although Lentz is from Charlevoix, Gascho will rely on him when he needs a push during races. They'll race together again during the Charlevoix Mud Run next week. "It was good having another kid pushing me," Gascho added. "Brendan Delaney left (because of graduation), and he pushed me, and we both got each other better. I think I found another teammate to help me with that, and that's Ben from Charlevoix." Charlevoix won the meet, followed by East Jordan, Harbor Springs, Mancelona, Boyne City, Kalkaska, J-L and Grayling. Gavin Weaver (19:17) and Jack Perry (19:22) rounded out J-L's Big 3 in 20th and 22nd place, respectively. Freshman Toby Hall stepped up and scored for the Cardinals in his second-straight meet, finishing in 21:15. Spencer Townsend (21:49), Cody Layman (22:14) and Elijah Fisher (22:16) also ran for J-L.
Charlevoix also won the girls meet. Harbor Springs took second, followed by East Jordan, Boyne City, Mancelona, Grayling, Central Lake, Kalkaska and J-L.
Sydney Townsend and Jersey Layman were J-L's top-two finishers. However, East Jordan's timing team made an error and didn't record the duo's official times. Lydia Hummel (24:53), Claire Mullins (28:57), Elizabeth Eaton (29:15), Kamryn Kennedy (29:50) and Holly Kussrow (33:42) also competed for the Cardinals. MANCELONA – Carlos Gascho sat out the first cross-country race of the season with a hamstring injury. The Johannesburg-Lewiston sophomore proved he's over the injury. He finished in 17:50 to individually win a nine-team invitational Saturday at Mancelona. It was the same course where he won his Ski Valley title as a freshman. Mancelona won the meet, followed by Grayling, Boyne City, Kalkaska and J-L. Also competing were McBain Northern Michigan Christian, Inland Lakes, Onaway and Rogers City. St. Mary didn't bring enough runners to score as a team. Jack Perry (20:13) continued to prove he's a solid No. 2 runner for the Cardinals this season by taking 14th. Gavin Weaver (20:53), who also missed the opener with an injury, took 22nd. Gage Boughner (21:30), Toby Hall (22:27), Elijah Fisher (23:00), Ethan Voss (23:25), Aaron Latusek (23:49), Evan Idalski (23:57) and Vince Hummell (24:17) also competed for the Cardinals. St. Mary's finishers included Ian Oliver (25:03), Aidan Yaske (26:27) and Kyle Brown (27:35). The girls race proved to be a boon for the rebuilding Snowbirds, who had three top-15 finishers. Alivia Zaremba, only an eighth-grader, took fifth place after crossing the finish line in 22:38. Bailey Murrell (23:59) and Emma McKinley (25:08) took ninth and 15th, respectively. Summer Sullivan (31:51) rounded out St. Mary's effort in 45th. While the Snowbirds didn't score as a team, they're just one consistent starter away from being able to compete at competitive Division 4 meets. Boyne City won the meet, followed by Mancelona, Inland Lakes, Grayling and Rogers City. J-L took sixth and Kalkaska finished last. Sydney Townsend, the 2017 SVC champion, placed seventh for the Cardinals with a time of 23:34. Also running for J-L were Lydia Hummel (26:41), Claire Mullens (30:20), Kamryn Kennedy (33:01), Elizabeth Eaton (22:04) and Holly Kussrow (34:24). No. 2 runner Jersey Layman missed the meet to take a college placement test. CENTRAL LAKE – Jersey Layman made one of the toughest decisions of her athletic career over the summer. She elected to stop playing volleyball, which she has played her entire life, and join Johannesburg-Lewiston's cross-country team. What a gamble. But it paid off. 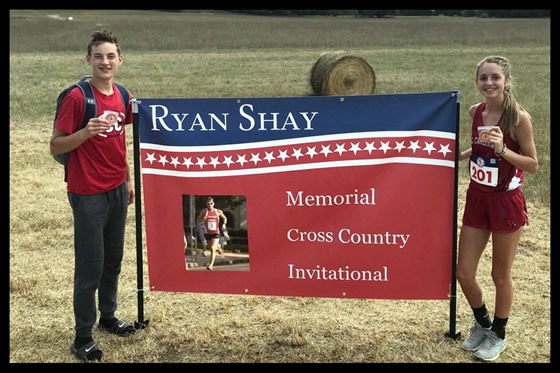 The senior completed the 2-mile Ryan Shay Memorial in 15:15 on Saturday at Jean Burns' Farm to become J-L's best girls finisher. The team's top runner, defending Ski Valley champion Sydney Townsend, was working at Otsego County Fair and unable to run. Layman, the rookie, picked up the slack, though, and finished 43rd among a stacked field of bigger Division 3 and state-ranked runners. "I felt like it was kind of what I had to do," she said. "Even though I had never run with them before, I felt like I had to do it for them and prove that I needed to be on the team." Layman's no slouch when it comes to running, however. Last year, she was the breakout star on the track and field team, even qualifying for the D4 state final. She was a middle distance runner, but she found success as a 2-miler by the end of the season. The confidence she gained in the spring made her curious about joining the cross-country team. It was a summer volleyball camp that sealed the deal for Layman, though. Once again, her position on the volleyball team changed, and she was tired of being moved around. "I talked to her about it and just decided, 'You know what? It's my senior year. I'm just going to go for it.'" Peppin gave Layman her blessing about switching sports. Now Layman is learning the nuances of running up hills and on rough terrain. She said she was overwhelmed by the number of runners in Central Lake, but she loved the freedom of not being restricted to one of the eight lanes on a track. "I loved it," she said. "It was so awesome (running on the trail) because it wasn't boring for one second. You always had something to look forward to, whether it was another hill or changing from grass to gravel to dirt to whatever it was." No one is as happy about Layman's addition to the team than coach Craig DeHoog. "With her and Sydney, that's quite the 1-2 punch," the fifth-year coach said. "If Sydney has the year that she had last year, this will be a really good team with Jersey on it, too. I think she'll be great. "We'll see how she does at a 5K, but she did really well. It's a lot different than track, but we talked about that with her and our newer kids. There are no lanes, so you can pass anytime you want. "For her to jump into cross and do that well – after playing volleyball for a number of years – I'm super proud of her." DeHoog said Layman's work ethic at practice is what sets her apart from other runners. But he's right. Running a competitive 5K for the first time will challenge Layman, especially since she's run only one 5K before – at the Lewiston Timberfest earlier this month. "When I ran the Timberfest 5K, that was hard for me, mentally, because I was running hard by myself the whole time," Layman said. "And I had no idea how fast to run it. There were hardly any girls my age there. (When I run my first 5K), I want to get the distance under my belt, get a feel for the race and still be competitive in it." Also crossing the finish line for the Cardinals were Kennedy Johnson (15:32), Claire Mullins (19:22), Kamryn Kennedy (21:22), Elizabeth Eaton (21:23) and Holly Kussrow (23:30). The boys team was without Ski Valley champion Carlos Gascho. The sophomore suffered a hamstring injury before the race. Junior Gavin Weaver also was unable to run with a knee injury. However, Jack Perry stepped up and led the team. The junior completed his 2-mile run in 12:15, good enough for 41st place. Gage Boughner finished in 13:39, followed by Toby Hall (14:09), Cody Layman (14:11), Ethan Voss (14:25) and Evan Idalski (14:49). "Our top boy, Jack Perry, I thought looked good, and I think we have some good things coming from him," DeHoog said. The Cardinals race again during an invitational Saturday, Aug. 25, at Mancelona. Layman will miss it because she'll be taking the SAT. But there's plenty of people excited about her making her 5K debut the following week. That includes her coach. "I'm glad she's running this year," DeHoog said. "She's a good kid. It takes guts to talk to your volleyball coach and make a change like that. She's a nice girl and a very good kid, and she works harder than anybody."